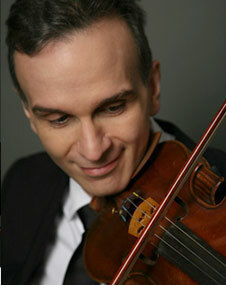 It would be hard to imagine anyone who plays with a more genuine sense of joy than violinist Gil Shaham.Shaham. He brought irresistible charm and dazzling artistry to his performance of Brahms’ Violin Concerto in D Major as soloist with the Cincinnati Symphony Orchestra on Friday night. The inspired concerto was the high point of an interesting program that included Sibelius’ Symphony No. 1 led by French conductor Yan Pascal Tortelier. No doubt there are many interpretations of Brahms’ Concerto. 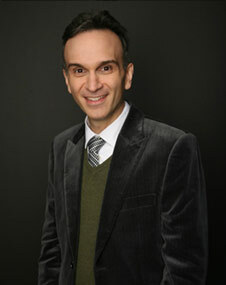 But Shaham emphasized the joy and beauty of this music as I have never heard before. From the moment he walked onstage, he never stopped beaming, even as he tackled its most difficult fireworks. The former prodigy, who was born in Illinois and raised in Israel, has been on the stage for much of his life, yet he took nothing for granted. Each note had meaning, and he communicated it to the listener. In the first movement, almost a concerto in itself, there were moments when his romantic style of playing recalled the golden age of violin playing, with the occasional “slide” up to a note. The lengthy cadenza (by Joachim, the violinist to whom the concerto is dedicated) was at times introspective, other times daring. 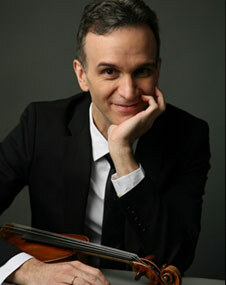 Shaham tackled stunning feats of virtuosity, yet made it all sound elegant. In the slow movement, which began with a beautiful oboe solo by Dwight Parry, one could revel in the tonal beauty of his “Countess Polignac” Stradivarius. The gypsy finale was fun to watch, as the violinist moved around the stage, often turning to engage with orchestra musicians and maestro. He played with such spontaneity, it was as if he were inventing the music on the spot. 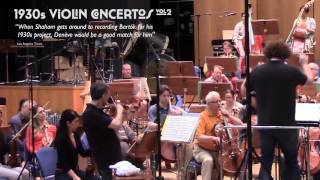 Tortelier was a sensitive partner in this collaboration, and led vigorously in the full orchestral passages. The evening opened with the Cincinnati Symphony’s first performance of American composer George Theophilus Walker’s Sinfonia Number 4 (Strands). The work was a co-commission of the Cincinnati Symphony with the New Jersey, Pittsburgh and National (Washington, D.C.) symphony orchestras. It was a well-constructed, bright piece, consisting of colorful motives fused together in what Walker calls a “mosaic-like texture.” The result was somewhat like viewing an abstract painting, with angular, chromatic phrases traded between instruments, brass fanfares and dissonances. There were atmospheric moments, too, especially during a section in which Walker wove in quotes from two spirituals. More nuance and dynamic variation in this performance would have made it more engaging. The composer, 90, who won the Pulitzer Prize for his song cycle “Lilacs,” was in the audience and took multiple bows from Music Hall’s stage for the appreciative audience. The program ended with Sibelius’ Symphony No. 1, not performed by the orchestra in two decades. It is a stunning piece that shows that the Sibelius sound world was already in place from the beginning. Tortelier’s resume includes chief conductor of the BBC Philharmonic from 1992 to 2003 and he is a frequent guest conductor of many great orchestras. Unfortunately, this performance suffered from unconvincing interpretation and unevenness in the orchestra. The conductor led animatedly without a score, often leaping and dancing, but unfortunately he missed the point. The elements that make Sibelius so distinctive – the sweep, power and cool “north woods” atmosphere — did not project in this performance. Missing was the inner propulsion, the sense of direction and overall arc that make the arrival of the gorgeous finale so satisfying. Still, it was enjoyable to hear this symphony, which deserves to be played more often. Orchestral soloists turned in expressive performances, starting with Jonathan Gunn’s beautiful clarinet solo, to launch the piece. Principal timpanist Patrick Schleker brilliantly executed the dynamic motive that drives the scherzo movement. The Cincinnati Symphony Orchestra repeats at 8 p.m. Saturday in Music Hall. 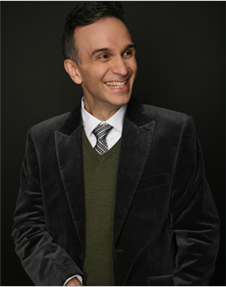 Tickets: 513-381-3300, www.cincinnatisymphony.org.